Sustainable Woodstock was founded at a community conversation in 2009. Sustainable Woodstock began informally in 2007 when a group of people affiliated with Woodstock’s Unitarian Church met to explore what they could do about climate change. When a capacity crowd packed the Woodstock Town Hall for an Earth Day celebration in April 2008, the signs were clear: the Woodstock community was ready to step up. 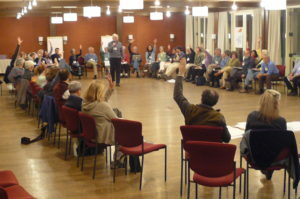 In late 2008 the original group collaborated with a municipal group—the “Community Identity” taskforce, which came out of a Vermont Council for Rural Development community visit in 2005, to sponsor a community discussion, which took place on Saturday, April 4, 2009. Eighty citizens gathered for a day at the Woodstock Inn to share their particular passions for sustainability and to talk about how to turn enthusiasm into commitment. Called Our Green Villages: Sustaining Environment, Economy and Community, this conference represents Sustainable Woodstock’s official launch. It produced the framework and principles that still guide the organization. The day following the conference, about 40 people met to form action groups focused on conserving and generating energy; strengthening the local economy; promoting local farms and foods; developing a local craft culture; expanding transportation alternatives; and creating community gardens. In the first year, those actions group took action! For example, the Economic Development Action Group put forward a recommendation to create an Economic Development Commission for Woodstock, which was approved by the town government and represents a big step toward creating a more well-rounded, sustainable local economy in a town that now relies primarily on tourism. And the Traditional Crafts Action Group sponsored the first “Naked Table” project, which offered people the chance to make their own dining table out of locally harvested maple and culminated with a localvore lunch for 100 people held under the rafters of Woodstock’s Middle Covered Bridge. We also laid the groundwork to become a nonprofit organization; hired a part-time director; developed by-laws; applied for, and received, status as a nonprofit in Vermont; and elected our first official board of trustees. In 2010, we continued to build our organization’s infrastructure and expanded our initiatives. In partnership with Pentangle Council on the Arts, we established a successful film series that screened films such as Food, Inc., and No Impact Man. In September, we received our official federal designation as a 501(c)(3) organization. And in May, Sustainable Woodstock collaborated with the Riverside Residents Association to build and plant 20 raised beds in their community. We also established a fourth community garden site. From the start, Sustainable Woodstock’s East End Action Group has worked hard on the thorny problem of redeveloping the blighted east end of town and has brought energy, creativity and determination to a challenge that has vexed this community for decades. Town and village officials endorsed their vision for a community park and encouraged this group to move forward with its plans.